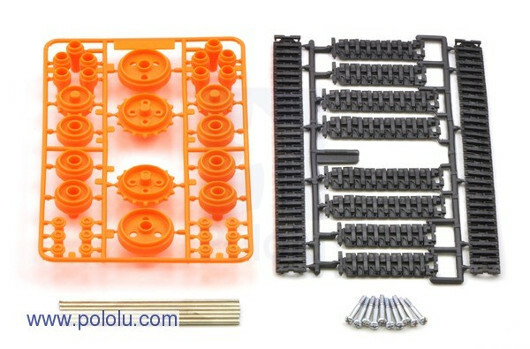 The kit includes various components: track, wheels, fasteners. Together with other Tamiya products allows you to create a complete chassis for the robot. Two large wheels with a diameter of 32 mm approx. The set cooperate very good with the universal mounting plate Tamiya and the Tamiya double gearbox. Set includes four wheels with a diameter of 31 mm and a width of 19mm. Set of two DC motors with gearboxes company Tamiya. The layout has a hexagonal shaft with a diameter of 3 mm. the User can select gear ratios: 58:1 and 203:1. Two sports wheels with a diameter of 56 mm and a width of 25 mm. Universal mounting board Tamiya 70098. Together with the other Tamiya components, it allows you to create a complete chassis for the robot. Kit for self Assembly, consisting of two DC motors with gearboxes company Tamiya. The system is equipped with a hex shaft with a diameter of 3 mm. the User can choose the gear ratios: 12.7:1, 38:1, 115:1 or 344:1. Universal mounting board Tamiya 70098. Together with the other Tamiya components, it allows you to create a complete chassis for the robot. The kit includes two pieces.